When you are building your home library, there are many types of books you should include. Most parents and teachers want to find the best books for kids to add to their home and school libraries. I am beginning a new series to help you build your library. I'll suggest several types of books and give examples of each type. Check out these books and then choose 3-4 that connect with your child. 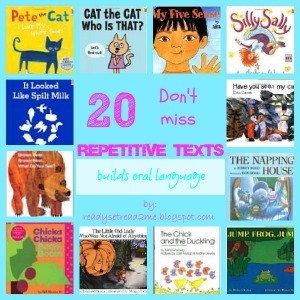 Repetitive texts are one type of book that should go into every preschool library. Repetitive texts are books that have a phrase that repeats several times or a pattern that repeats several times. They allow children to become active participants in read aloud time. Children need to be participating orally in our read alouds. In fact, if a child doesn’t hear a word or a language pattern, they won’t say it. If they don’t say it, they won’t read it. I have sat through many early readers trying to sound out the phrase, “Once upon a Time…” If they have never heard a story that began "Once upon a time" they will never figure it out. On the other hand, a child who can’t read independently but has heard a ton of stories that begin “Once upon a time” may be able to easily “read” this phrase. In Mem Fox's book "Reading Magic" she says that a child needs to hear 1,000 stories before they begin to read independently. I think it would benefit your children if some of these favorite repetitive texts are included in the 1,000 + stories they will hear before they begin to read. 1. Pete the Cat: I love my White Shoes by James Dean and Eric Litwin Pete the Cat is walking down the street in his white shoes which change colors as he steps in piles of strawberries, blueberries, and mud. He doesn't let his colorful shoes get him down, he keeps singing his song... his very repetitive song! 2. Pete the Cat Rocking in My School Shoes by James Dean and Eric Litwin Pete the Cat is hot, hot, hot with my preschool boys. In this story, he is rocking a new school year as he sings his school song... his very repetitive school song! 3. Pete the Cat and His Four Groovy Buttons by James Dean and Eric Litwin Once more, Pete the Cat faces the challenges of life as he loose buttons off his shirt. Does he cry? Goodness NO! He keeps singing his song... his very repetitive song. 4. Pout Pout Fish by Deborah Diesen The Pout Pout fish is a gloomy member of the underwater world. His friends swim along and try to get him to give up his gloomy ways. To each encourager he offers the same repeating refrain, "I'm a pout pout fish with a pout pout face for spreading dreary wearies all over the place. Blub, blub, blub." Eventually, someone comes along that helps him turn his frown upside down. 5. Cat the Cat Who is That? by Mo Willems. Another hot item in our home currently is any book by Mo Willems. Of course, I had to include a Willems book in our top 20 repetitive books. Many of them lend themselves so well to young learners actively participating in the reading of the story. Cat the Cat is one of the most obvious repetitive texts. Cat the Cat moves through the book introducing us to a whole cast of characters. ! 6. Brown Bear Brown Bear by Bill Martin and Eric Carle This classic book follows a pattern on each page as each animal introduces the next animal in the story. "Brown bear, brown bear what do you see? I see a red bird looking at me." The red bird picks up the pattern on the next page and continues the pattern through out. 7. Panda Bear Panda Bear by Bill Martin and Eric Carl This book continues the pattern from the Brown Bear book. This is a nice way to help children transfer the knowledge from one book to another and firm up their knowledge.This book focuses on endangered animals..
8. Polar Bear Polar Bear what do you hear? by Bill Martin and Eric Carl This book also continues the pattern of the previous books but it focuses on animal sounds. 9. Kitty Cat, Kitty Cat are you Waking Up? by Bill Martin Jr. This book has a repeating pattern and a rhyming text. It is a little cutesy but my kids love this little kitty who doesn't want to wake up and get ready to go! 10. Chicka Chicka Boom Boom by Bill Martin Jr. A rhyming stories of letters racing up a coconut tree is interspered with a repetitive jingle. Kids can't help but join in the silly sounding words in this book. 11. The Napping House by Audrey and Don Wood As a child, a cat, a dog, a mouse and a flea pile into bed with a sleeping Grandma in this story, the reader gets to experience a predictable pattern of text. 12. The Chick and the Duckling by Mirra Ginsburg When a duckling is born moments before a baby chick, the chick admires the older duckling and copies each of his actions with a repetitive "me too". The ending of this book is a fun surprise for kids! 13. Have you seen my cat? by Eric Carle In this story, a little boy loses his cat and travels the world asking "Have you seen my cat?" The repetitive phrase, "This is not my cat" will be wonderful for children to chime in. 14. It looked like Spilt Milk by Charles G. Shaw In this story, a white shape on a blue background changes with each page turn. The repeating phrase, "It looked like..." allows children to join in on a guess. This is one your child will be able to "read" independently long before they can actually decode text. 15. Silly Sally by Audrey Wood Silly Sally and her friends parade into town in this cummulative rhyming text. 16. Jump, Frog, Jump by Robert Kaplan This is a cummulative tale of a frog who tried to catch a fly but then found himself in the place of the prey. He escapes many attempts at being eaten when readers shout, "Jump, frog, Jump!" 3 Repetitive Texts that will engage your child's emotions: When your child reads the repetitive phrase in these books, they are able to express the characters emotions. It's a safe way for your child to express being grouchy, mad, or scared! 17. The Grouchy Ladybug by Eric Carle While this book does focus on a grouchy ladybug who thinks he is big stuff and wants to stir up fights, it allows children to join in expressing a phrase they have all felt. They are able to sassily say, "Oh yeah, want to fight?" in a safe environment. 18. Alexander and the Terrible, Horrible, No Good, Very Bad Day by Judith Viorist This is a longer text embedded with the repetitive text, "It was a terrible, horrible, no good, very bad day." The story is one that children (and adults) can relate to. Reading the book can be almost therupetic. 19. The Little Old Lady Who Wasn't Afraid of Anything by Linda D. Williams In this book, children repeat the sounds that a little old lady hears in the woods. The suspense in this book builds, but the ending is funny rather than scary! 1 Repetitive Nonfiction Text: Every collection should have some nonfiction. I am working on growing our nonfiction selections as my boys LOVE it! 20. My five sense by Aliki This book explores the five senses. Several of the pages have a repeating pattern and your child will love to try and read these pages. The best part of repetitive books is that your child will want to hear them over and over again. In fact, your child needs to hear these texts over and over again! The more they hear them, the sooner they'll join in the reading! You can add a few of these to your library and have books that will last for a long time! These are such tried and true anchor texts that teachers will refer to over and over in Pre K,K, and first grade. Children need to be familiar with such stories for their own language development and hearing sounds they will later read with more ease. Great post. I am so with you on 1000 stories and building a vocabulary before fluent reading can happen. A lot of our former favorites are on your list. I had never read I Love My White Shoes until both my kids came home from different schools singing the book all day long! It's a great one. Another one I'd recommend is The Little Red Hen, which the kids love repeating, too. This is the House that was Tidy & Neat by Teri Sloat and R.W.Alley is based off of the traditional nursery rhyme "This is the house that Jack built" and has plenty of repetition and predictability. We also like "Blue Hat, Green Hat" by Sandra Boynton. What a great list! We love the Pete books.